Birthday goodness: It was my best friend’s birthday on Tuesday and a small group of us headed out to Woktastic in Birmingham City Centre in the search of yummy Sushi and Japanese food. Needless to say I had been to Woktastic twice the week before, so I simply thought a third time couldn’t hurt. We ate so much and you pay £14.99 for unlimited amounts. 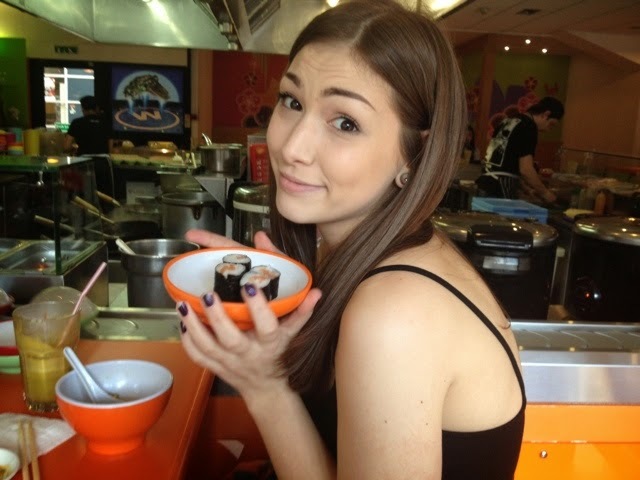 The sushi dishes go around on the conveyor belt and I told Meg (the birthday girl) – that it would be fun to stand on top of it and for it to take us around the restaurant. She told me this wasn’t possible and burst my bubble. But we had fun and enjoyed her buffday food. I love you Meggie! Books: I treated myself to two more books this week. One being ‘The Fault In Our Stars’ in which I’ve heard amazing reviews and several people tell me it’s a ‘must read’. 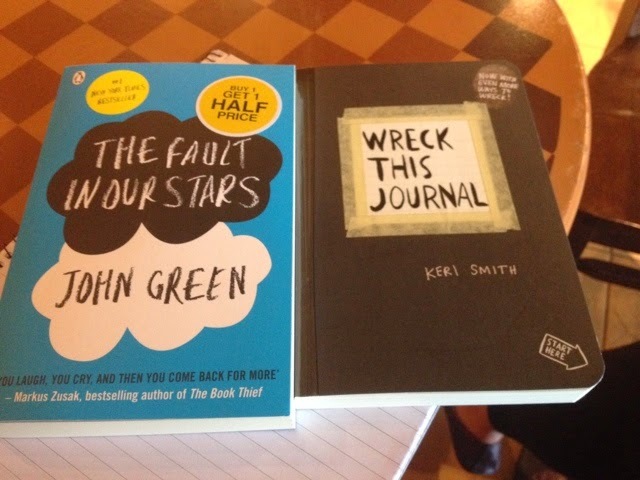 So I went to WHSmiths on my lunch break on Wednesday and bought the John Green novel, as well as ‘Wreck This Journal’. I’m trying to do other things in my spare time besides sitting on my phone and texting people constantly. I want to draw myself away from my social media scene now and again and just dig my nails into something creative. The book allows you to explore your creative side and it asks you to do things to the journal, like rub tea and coffee all over it, paint on certain pages, scribble notes and even asks you to give one of the pages to a random stranger. It’s been out since 2007 but I’ve heard good reviews on the perception of the book so I wanted to give it a try. I’ll update my blog with pictures of my creativeness over the next couple of weeks! Granola goodness: I’ve been trying to eat healthy delicious things for breakfast each morning. I find that when I eat good, I feel good, so i’m hoping to keep this good feeling at bay for as long as possible. 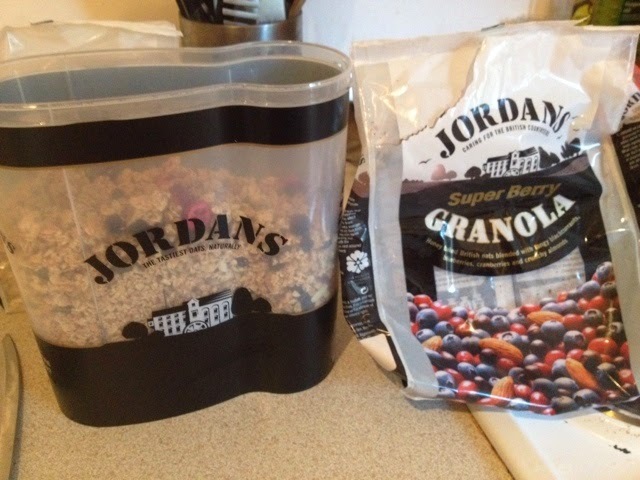 I came across a granola cereal called Jordans last weekend while I was shopping around Costco. I bought several packets in bulk, and they came with a pretty little contrainer to make breakfast time that tiny bit more fun. It contains honey oats, blackcurrents, blueberries, and crunchy almonds. Each bowl tastes SO good, that I actually wrote to the company to tell them how much I was enjoying their breakfast cereal like the saddo that I am. I received a letter the very next day which said how much the Jordan’s company like my blog (yay!) and they gave me some free coupons for some free bags. Brilliant! You can get the cereal from any local supermarket and if you haven’t already, check out their website here! In all it’s been a good week – and if you like my posts, don’t forget to add me on my Bloglovin page to subscribe to my page! Or make sure you follow me on Twitter!